It may seem disgusting to some of you, but actually, if you have straight, oily and fine hair like myself (what can I say? I’m Asian! ), then dry shampoo is your savior. Why? Because it allows me to have VOLUME without having an oily head – EW! Thanks to my girl Wendy, she supplied me with the Tresemme Fresh Start Dry Shampoo to try out. I already bought the Ojon Rub-out Dry Cleanser from Sephora, but I HATED the smell of it. I prefer Tresemme because I actually own a ton of Tresemme hair products, particularly hairsprays because I like the scent and it gives enough flexibility so my hair isn’t rock solid. Their dry shampoo gives off the same scent that I love and actually doesn’t leave any white powdery residue that Ojon does! 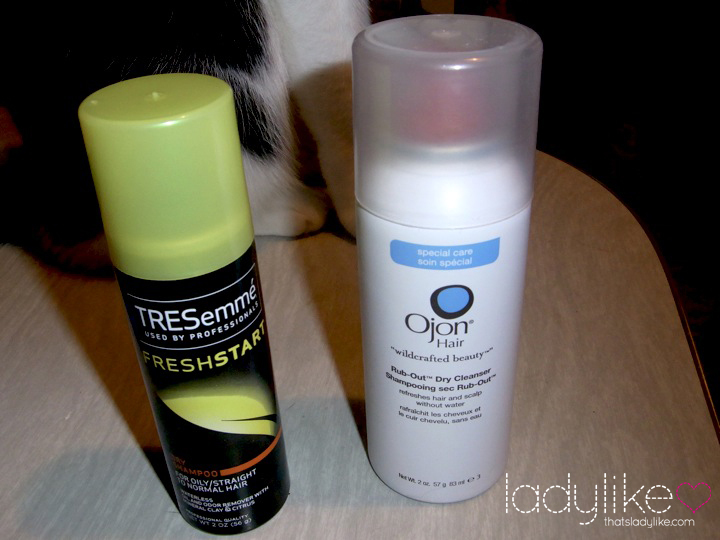 So if you’re looking for a cheap dry shampoo that you can get at any store, go for Tresemme for the win!